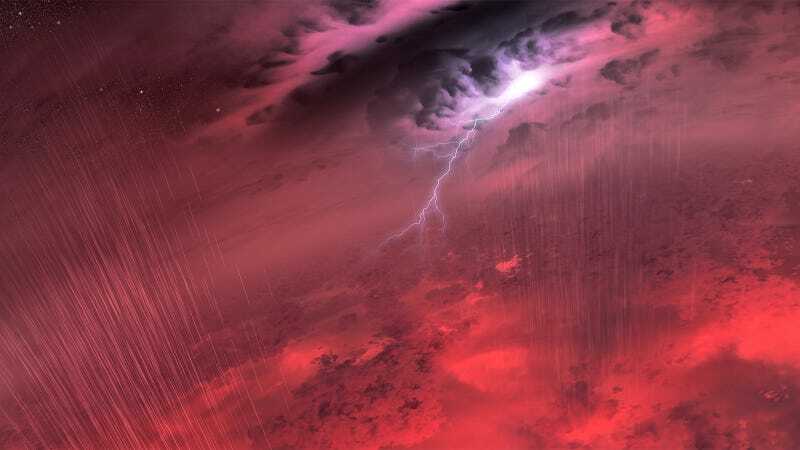 The scene seems like a storm over a sea of lava somewhere in Mordor, but you are looking at the surface of a failed star—the weather on a brown dwarf based on new data from the Spitzer Space Telescope. It's spectacular. Even more so when you think that's not water falling from the sky. When you take into account that half of the objects would be oriented in such a way that their storms would be either hidden or always in view and unchanging, the results indicate that most, if not all, brown dwarfs are racked by storms. Brown dwarfs are failed stars that don't have enough mass and pressure to ignite the fusion of hydrogen in their cores.